Outlaws attempting to kidnap Steve Blaine from a stagecoach are ran off by the sharpshooting of his sister, Sally and rescuers Jimmy Wakely and Cannonball Taylor. Steve is investigating his father's sudden death after charges of theft from the Sloan/Carson mine. Sloan is killed after Wakely learns that ore is being smuggled across the Mexican border into the mine, and then sold at the higher U.S. prices. Across the Rio Grande featured the musical talents of a young Polly Bergen who had just started in films. She does a duet with Wakely in the saloon, where she's working as a musician (this was a kid' western, we didn't know about ladies like Miss Kitty). Playing the guitar, she sings the title song. In a letter to me, she said that this was the film that got her a Guild card. I think she was on for about 15 minutes. Her duet is included in the original trailer for the film, which is available in several groups of B western trailers. 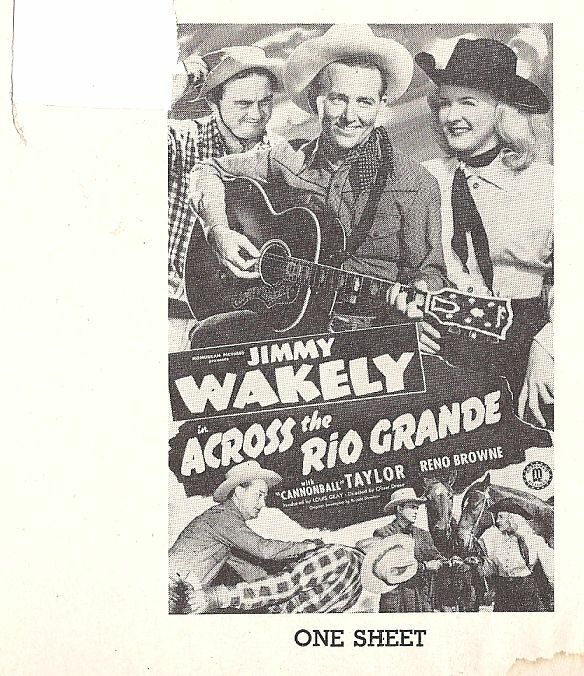 While Wakely may not have been a big star in westerns, he was influential in getting several performers their start in show business and wrote many songs. He and his family did a nightclub act in Harrah's in Las Vegas for years. Across the Rio Grande is directed by Oliver Drake and written by Ronald Davidson. It stars Jimmy Wakely, Dub Taylor, Reno Browne, Riley Hill and Dennis Moore. Music is by Edward Kay and cinematography by Harry Neumann. Running at just under an hour, Across the Rio Grande is pretty much a quintessential "B" Western for the decade it was made. It crams as much as it can into the story and has no ideas above its station. Plot finds amiable Jimmy Wakely and his amusing side-kick Cannonball Taylor in amongst silver smugglers, murder, kidnapping, jail breaks and of course shoot-outs and fist-fights. There's even time for a couple of songs and a magic trick! and a gun phobia angle and also a cheeky locked room murder that adds some meat to the frothy stew. A fairy's boyfriend was turned into unicorn by a love-hating witch, but Alex realizes she just needs a friend. This is everything that this show has been waiting for. It starts off very light hearted; Ruby and Sapphire's wedding is a very long awaited thing that was extremely enjoyable. While Steven's song was bittersweet, it still made me smile. 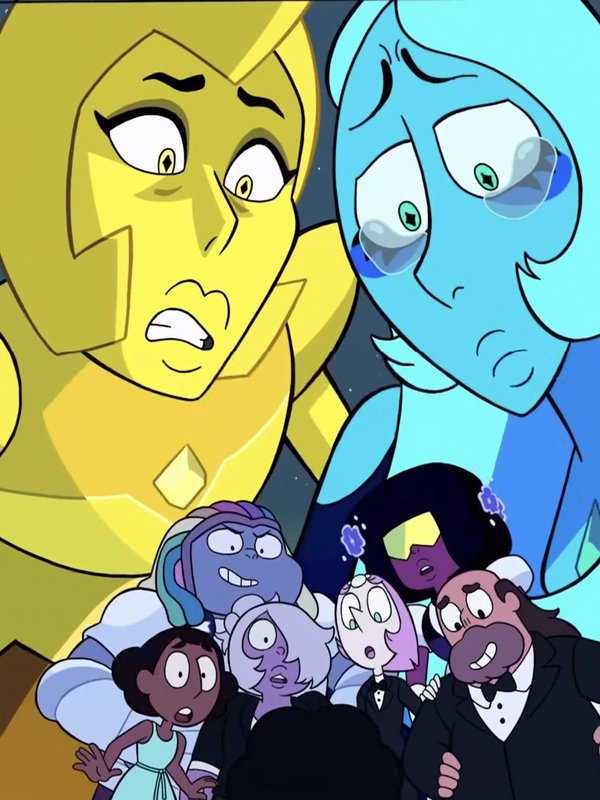 The entrance from Blue and Yellow Diamond was PERFECT. While we all knew they were arriving from the promos, the way they did so by using Blue's forced empathetic ability was brilliant. 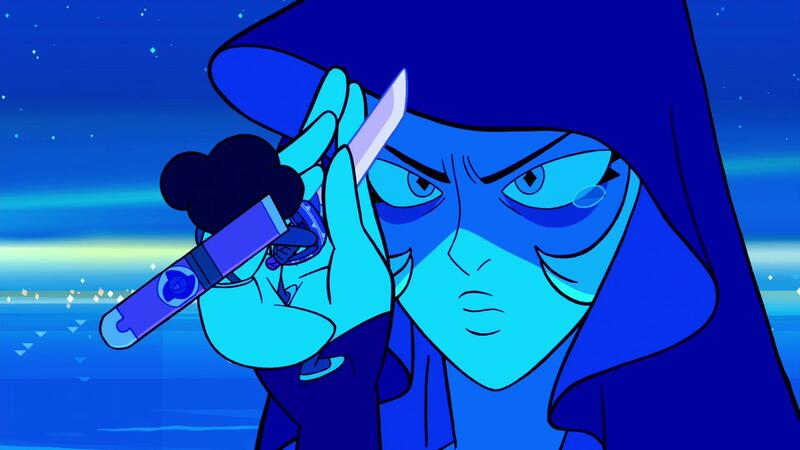 Not only that, we got to see the individual fighting stances of each gem, including the Diamonds. Lapis' entrance was PERFECT, and I admit I gasped when Peridot got poofed and even more when Yellow attacked Steven. Just...this episode went above and beyond. You could tell the creators went all out with this one. It's a must-see.